Chile’s new “complete streets” approach will be a paragon of integrated transport. Photo copyright Marcelo Kristopher. In 2006 Santiago, Chile implemented a public transport reform that reorganized the capital city’s buses into an integrated system with its already successful metro. The well intentioned reform was initially a disaster. Delays, overcrowding, long waits, and unreliable service caused widespread frustration, spurring protests in Chile’s capital. The failures of Transantiago led many to abandon public transport, driving personal vehicles to work instead. As I wrote in 2007, the concept was good but “the devil is in the details.” Santiago had been ambitious, but the new system was poorly designed, ignoring basic good practices for an advanced bus system, such as median stations with advance ticketing and fully dedicated bus lanes. Over the next few years, the Chilean government worked hard to fix its mistake – by 2010 the system was rated favorably by users. Delays and overcrowding ceased, but poor reliability, fare evasion and a bad image remained. As a response, the national government announced plans to overhaul of the surface transport using a “complete street” approach to bus corridors throughout Santiago de Chile. 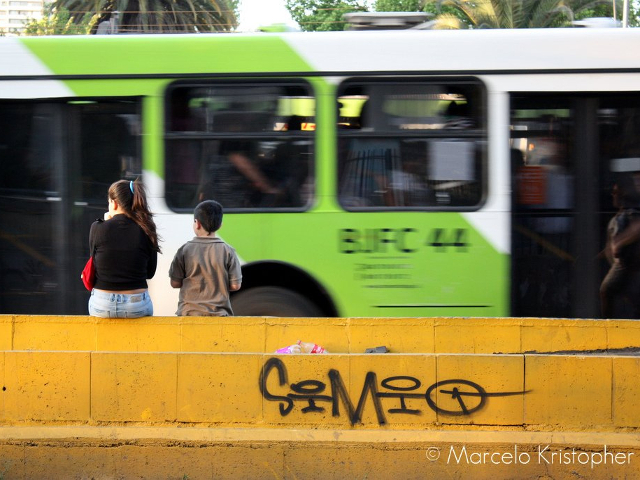 One of the first corridors to implement new design concepts and participatory planning is Alameda Boulevard, the most emblematic corridor of the city and the country. The boulevard, actually named Avenue Bernardo O´Higgins, honors the leader of the Chilean liberation from Spain 200 years ago. The Chilean government is taking the “complete streets” project very seriously, as a beacon of cutting edge, multimodal integrated transport and urban revitalization. This time, they aren’t taking any chances. Along with the newly formed Metropolitan Directorate for Urban Transport (UTPM), Chilean leaders are consulting several parties that were left out of the process in 2006, including several national government agencies and the Greater Santiago municipalities of Lo Prado, Estación Central, Santiago and Providencia. They are also consulting urban planning and public transport experts to make sure they get the “details” right. Urban design experts from Brazil, Chile, Colombia, and Mexico joined Santiago’s authorities in envisioning an urban redevelopment concept for Alameda. The project is expected to be ready in late 2016, and has many challenges to face before its completion. Like many other projects, this visionary new corridor will require political leadership, technical capacity, and adequate funding. When it is finally completed, it will be an example for Latin America and the world, of how a city can go beyond transit to a holistic, accessible, integrated urban space: a “complete Alameda” for the people of Santiago. The list of experienced public transport consultants shows how serious Santiago is about getting the details right. Among the experts were Pedro Szasz and Paulo Custodio, designers of several bus systems in Latin America, Africa and Asia; Salvador Herrera, Luis Zamorano, Claudio Sarmiento, and myself from EMBARQ; André Jacobsen from Latin America’s Integrated Systems and BRT Association SIBRT; and Juan Carlos Muñoz, Ricardo Giesen, Rocio Hidalgo, Margarita Greene, Juan Carlos Herrera, and Marco Batarce, professors of engineering and architecture from Pontificia Universidad Católica de Chile. Santiago’s Directorate for Urban Transport, with the support of Pontificia Universidad Católica de Chile, organized the design charrette. With the help of these organizations, we walked and used the buses and the metro in the corridor, looked at the data and previous proposals to understand the issues, and then put our heads together to suggest the best possible urban project for the historic corridor. By involving multiple institutions at the national and local levels and design experts in the early stages of the planning process, Chile is setting itself up for success.